﻿ Puri Sading Hotel, Bali | FROM $31 - SAVE ON AGODA! 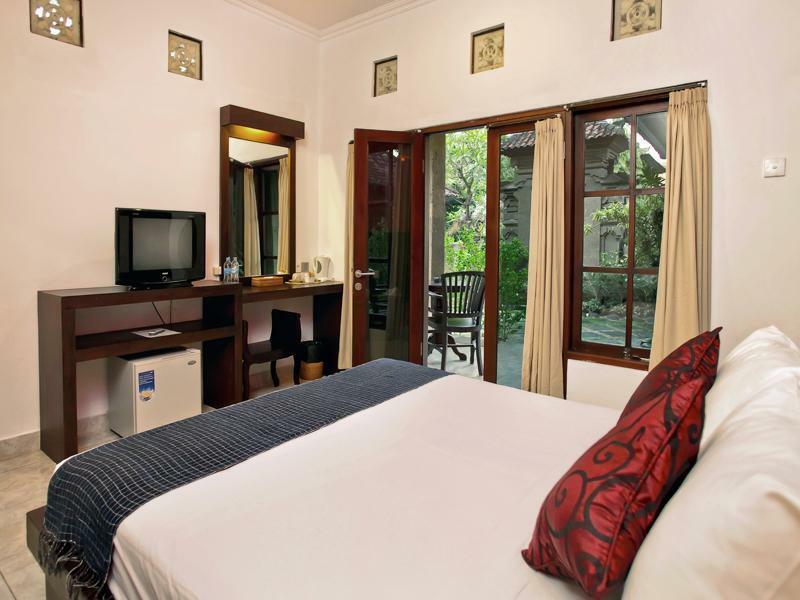 "Clean and comfortable budget option in Sanur in a great loca..."
Have a question for Puri Sading Hotel? "We booked this place last minute and found a gem, the staff are amazing and the rooms are simple but very well equipped." "Great smaller hotel, most rooms have been refitted, and the hotel surroundings have been updated." "The hotel is cozy and with a lovely garden and pool." 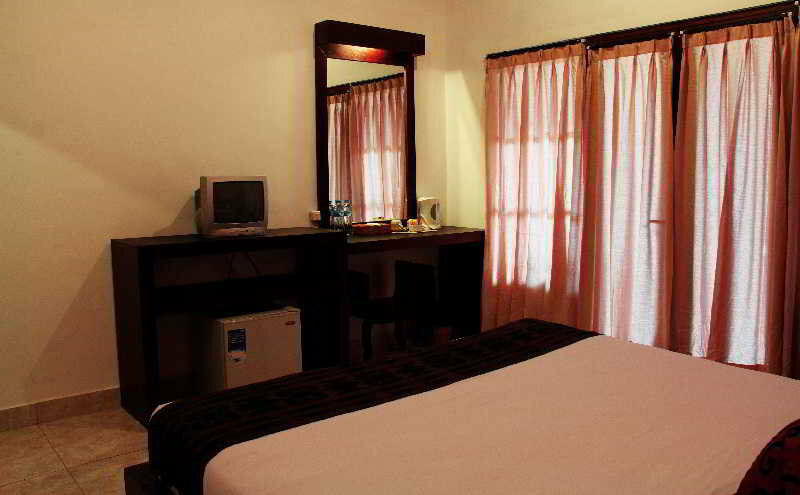 This budget hotel is situated in the heart of the resort town of Sanur and is a five-minute walk from the beach. The Puri Sading Hotel offers guests competitively priced accommodations with easy access to the area’s many restaurants, bars, supermarkets, and the popular Art Market. The budget accommodation is more suitable for younger travelers who prefer a place in a central location close to a busy tourist area. All cottages at the hotel are beautifully decorated and come with spacious balconies overlooking the swimming pool or man-made waterfall. The nearest beach is only a stone’s throw away, and the capital, Denpasar, is a comfortable five-minute drive away, where visitors can pick up beautiful batik cloth souvenirs cheaply. Reservations at Puri Sading Hotel are simple via our secure online booking form. Just enter your desired dates and submit. 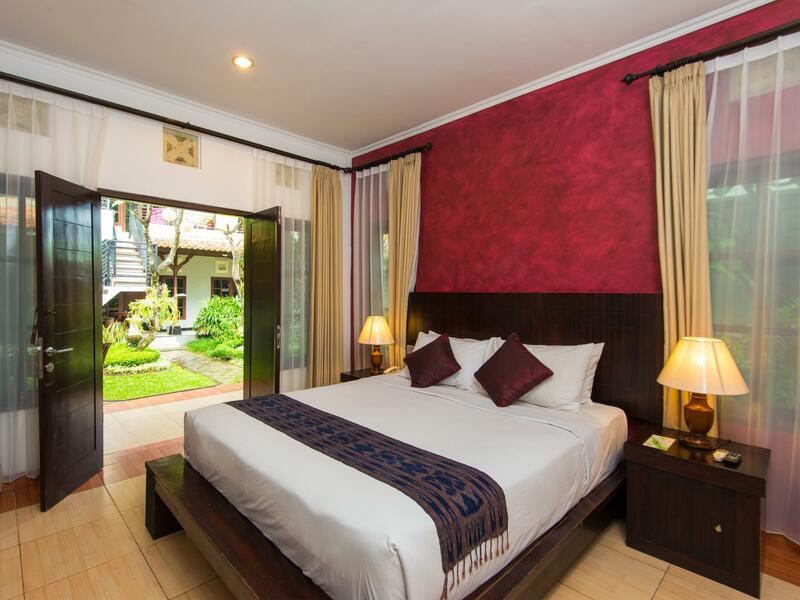 Clean and comfortable budget option in Sanur in a great location. Upstairs rooms behind the pool have nice balcony and set back enough from the road to be quiet. Very friendly and helpful staff. Check out The Porch Cafe nearby for great breakfasts! One of the most immaculate grounds for a hotel in bali. The pool and gardens were beautifully kept. The staff were always smiling and friendly and could not do enough for you. Close walk to cheap restaurants and beach front. Nice quiet area. Would defintiely stay again. 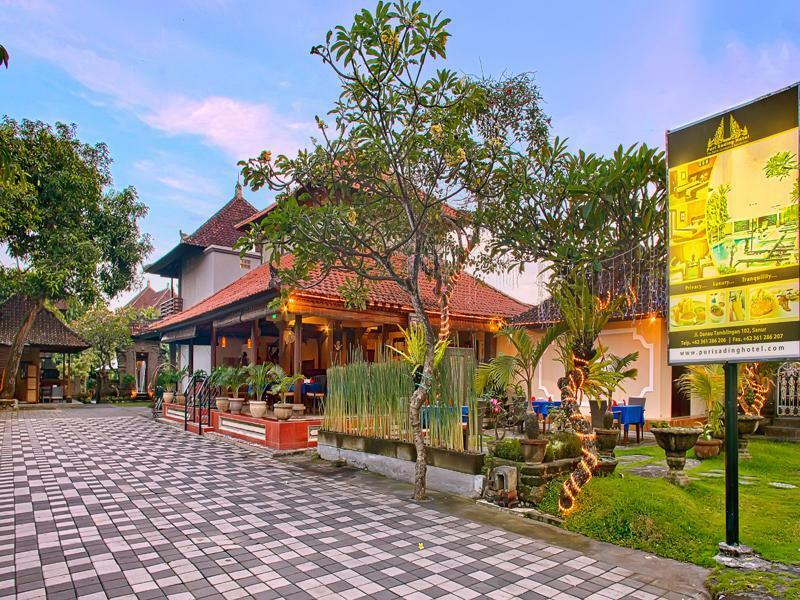 A great little gem of a hotel centrally located in Sanur. Clean linen, Comfortable beds, well kept gardens, sparkling pool and a breakfast included for a reasonable priced hotel with smiling staff as well. Restaurants and bars line the road outside for your entertainment and the beach front is just a short walk across the road. Enjoy folks. Back again this Dec 2017. This hotel is right in the heart of Sanur. Only a small hotel (20 or so rooms) the rooms were clean and as is the fact with Bali hotels a few years old, the furniture dark. Bathroom probably needs a make over but it was serviceable and clean. Excellent pool and surround. The real surprise was the restaurant. While breakfast was basic but good, the lunch and dinner food was simple amazing and cheap. Even if you don't stay here, check out the food. Great little hotel in Sanur. Not a huge complex, but very comfortable. We had room 115 in the very rear block on the 2nd floor. Only 1 neighbour and very quiet, except for the morning rooster, but then, that is Bali.Big room, big bed. Breakfast is all you need, but not a lot of choice,but it is included in the low price. Small but satisfactory swimming pool. All you could ask for. Highly recommend. Very clean hotel, with a beautiful garden and great swimming pool.Kind and discreet staff,excellent breakfast,quiet place at a short walk from the beach.We have felt like home!! Retro Caffe & Gallery is close to the hotel and the food is very tasty. Great smaller hotel, most rooms have been refitted, and the hotel surroundings have been updated. This hotel is better than a year ago. Location is in the middle of Sanur for tourists, so most things are walkable. I highly recommend this boutique hotel. Great central location, set back off the road so quiet, very comfy beds and pillows with crisp white linen you would expect in five star. Pool lovely and clean. Very nice staff with communication skills. The hotel organized a driver to collect us from the airport and our upstairs room was clean and tidy. The bed was very firm, which is Ok, if you like . Breakfast was a choice of eggs cooked to your liking and a bainmarie with bacon, sausages, tomato, nasi/me goreng , plus toast croissant, coffee and tea.. Pool towels were supplied and the pool was always clear and clean.. For a small hotel, I would stay again. We spent 2 nights on Arrival to Bali then travelled around & spent 1 night before we back to Australia . we were so pleased that when we return to Bali we will stay there again because of the following. clean large room with good beds good breakfast food in restaurant tasty & good priced cold beers good priced. central location last but not least friendly happy staff. Attentive, friendly staff; great location; excellent value. My second visit at this hotel; staff remembered me from 2011 (nice touch). Staff is very friendly, and attentive. I think the new buffet breakfast is an improvement from my 2011 stay. Reasonable amount of choice, and eggs done right and made to order. Room was clean and comfortable. AC worked well. Grounds are still well maintained. Received an upgrade to the pool room view; these rooms are quite comfortable, and the DVD player is nice to have for those nights you just want to stay in. For families with kids, the ground floor model might be a wise choice. Lots of great dining options nearby, and Hardy's department store is just down the street. Highly recommended. Puri Sading is a great place to stay in Sanur, if you are not looking for up-market, high rise accom. It is a small, quiet hotel in a good location, central to restaurants, shops and the beach. The staff are friendly and very helpful. The restaurant at the front of the property has a reasonably sized menu and the food, while not 5 star cuisine is mor than adequate. We were travelling with our adult children and their two young children and the staff were very accomodating. The pool is in the centre of the hotel but as the whole complex is not huge there were always sufficient sunbeds etc.. Our rooms were at the rear of the hotel and very quiet. Would definitely stay here again. My stay of 7 nights in Puri Sading was a good experience. I had room #103 which was opposite reception a great position for a solo lady traveller. The room was large, clean, good A/C, and well appointed with all the facilities you could want, except for a safe, that having been said the did have safe boxes at reception so it wasn't a bother. The pool area is very relaxing with ample comfortable sun loungers. Staff are all very friendly & helpful. Lovely little hotel with all you need. Old style Bali with friendly staff. Smallish pool and basic breakfast but need to keep in mind what you’re paying when comparing to other hotels. Would stay here again.